I'm one of those people that cannot function if I'm not organised; my brain can't seem to cope without knowing I have my lists and notes. Things just fall apart and get forgotten! In January I decided it was time to get my act together blog wise and created my first ever monthly post planner. It wasn't very sophisticated - I literally hand drew a calendar in my small notebook and wrote the posts in at the beginning of the month. But it was a start and I found it really, really helped me stay on track, mainly by knowing what posts and photos to complete as a priority and when to schedule the completed drafts for. The only thing that didn't work for me was when I wanted to make changes to what I was posting and when (which I do quite a lot - in fact I wasn't meant to be posting about this today as per the original plan!). I ended up with a page of scribbles and arrows and it looked a right mess; not very easy to follow at all. 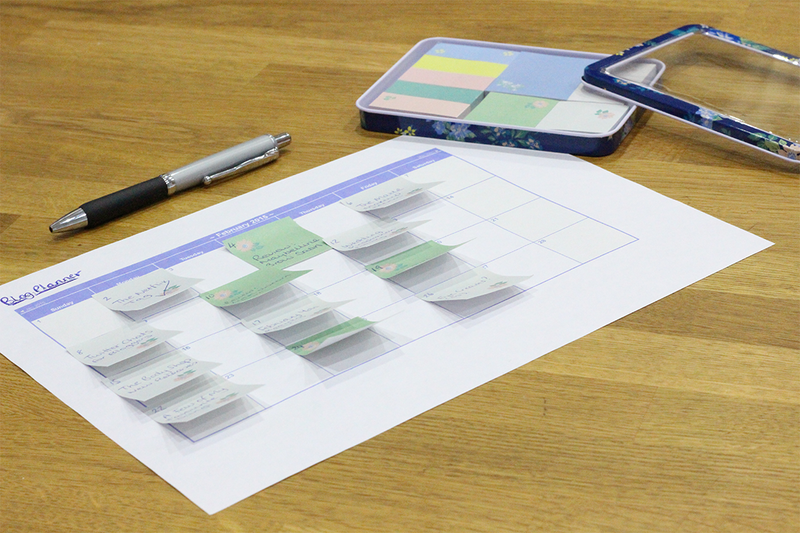 Enter the new and improved monthly blog planner for February! This time I downloaded a free Excel calendar template from the internet (I think I googled pretty much that text) and just re-sized the boxes to make them a little bigger. I printed this off and instead of writing the posts straight onto the planner, I wrote them onto little post-it notes and stuck these on to the dates I plan to post. This way I can very easily make changes to the plan, whilst keeping it looking clean and tidy. The whole process of setting up my new blog planner didn't take very long - maybe 15 minutes, which is worth spending because it will save me more time over the month to come. Next I want to re-organise how I keep track of the posts I need to write and photos I need to edit to keep up with the proposed blog plan. Again these are just untidily scrawled in my little notebook at the moment... If you have any suggestions for improvement then please let me know! Do you plan your blog posts ahead? What methods do you use to stay organised with posts? This is such a great idea - especially with the post-its! I admire your mad organisational skills! ;) Jade and I use a Google calendar during busy periods! I always find these organization posts very motivating, even though I'm not as organized myself. It's actually nice to see how you can make your week & month easier by just planning ahead...I wish it was more part of my character...if you know what I mean. But at least I'm big on post-its!